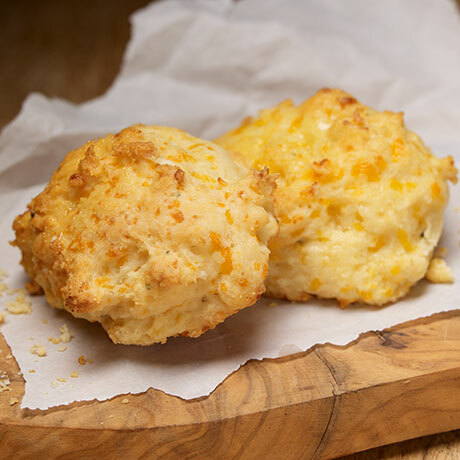 Asiago, Parmesan, and Cheddar Cheese flavors combine for this delightfully delicious drop-style biscuit. Yields 15 biscuits. Enriched bleached flour ( (bleached wheat flour, niacin, iron, thiamine mononitrate, riboflavin, folic acid), vegetable shortening(contains one or more of the following: [canola and / or palm oil] with preservative [TBHQ], nonfat milk (fortified with Vitamins A & D), leavening (baking soda, sodium aluminum phosphate, aluminum sulfate, monocalcium phosphate), dextrose, contains 2% or less of: salt, whey), Parmesan cheese (whey, maltodextrin, buttermilk, natural Parmesan cheese flavor and salt), Asiago cheese (whey, maltodextrin, buttermilk, natural Asiago cheese flavor and salt), garlic powder , Cheddar cheese (whey, maltodextrin, buttermilk, natural cheddar cheese flavor and salt),and basil.